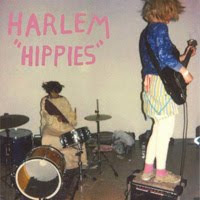 There’s this Austin, TX trio called HARLEM, and I’d been noticing their CD “Hippies” on Matador for a few months. It’s got an intriguing cover, as you can see. I did some online scouting, liked the few indie-garage songs I heard, and decided to pick the thing up. Outside of the fact that 16 songs is about four-to-six songs too many for just about any band on any album, “Hippies” has got some real good honest-to-goodness garage chug going on, leavened with a dose of 1950s bubblegum pop shimmer. These guys – and they’re all guys – sit squarely in the middle of a road that winds through some of the more bent 1990s indie bands that Matador made their stock in trade (GBV, Pavement) and into something a bit more raw and dirty. Nothing exceptional, but there are a few corkers on the disc, starting with “Somewhere Soon”, a track I’m posting for you today. I was hoping that their “Spray Paint” would be just as spazz-out & crazed as Black Flag’s but it’s a totally different (tamer) beast yet nearly as fun. I’d go see these guys live, let’s put it that way, but if I missed ‘em in favor of a warm bath that’d be OK too.